At DutchCrafters we offer a wide variety of contemporary furniture and modern furniture that is all Amish handcrafted in the USA. The Amish leave no stone unturned when it comes to bringing you the latest in solid wood furniture. 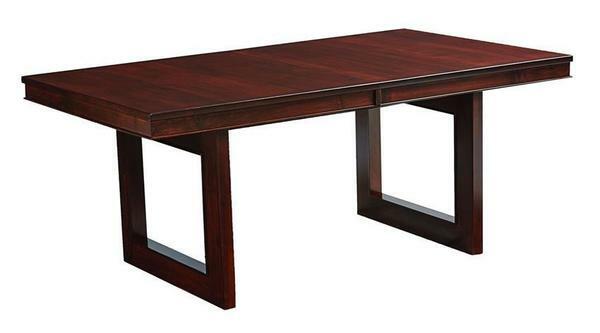 They offer a wide variety of contemporary designs like the Kalispel Contemporary Amish Dining Table. The Kalispel turns on the chic with its creative squared cut outs in the base. Clean form and smooth lines are everywhere in this solid wood dining table. The Kalispel is perfect for dining room, breakfast nook or kitchenette as it comes in standard, counter or bar height. Available in 42" x 72" or 48" x 72". All of our Amish tables have at least a 1" thick top. The Kalispel goes as thick as 1 1/4" or 1 1/2" if you wish. Choice of table edge style with six to choose from. Add up to 4 table extensions. Each extension measures 12" wide. Pick your favorite wood type and finish color for your new table. We are happy to mail samples for you to consider. Great match with Kalispel flat backless benches to create a contemporary dining room table set. You can pick your options online or tap into our customer service with the help of a Furniture Specialist. They are happy to help you decide on dimensions, wood types and more and can fill you in on shipping as well as answer any questions or concerns you might have. We can't wait for your new custom furniture to arrive. Thank you for taking the time to shop at DutchCrafters. Distance from Leg to Edge of Table: 12"
Distance Between Legs: 42 ½"
Shown in Lyptus Wood with Nutmeg Stain. Please call to order this wood option.